The 2016 preseason Top 25 college football (CFB) polls, including ESPN’s FPI rankings that we reviewed last week, are pounding down the Pac-12. In the four ‘big time’ polls, the putative 2016 champion Stanford Cardinal is ranked as follows: ESPN 8; FOX Sports 11; Sports Illustrated 11 and CBS 14. The Oregon Ducks are not ranked higher than 20 in any of these polls. These preseason polls verify that the Conference of Champions has fallen from what was generally considered to be the second-best Power 5 Conference two seasons ago to the Rodney Dangerfield of CFB. We Left Coasters can scream loud and long about this lack of respect and east coast bias, but based on performance, our complaints sound like a baby crying for his bottle. The Pac-12 last won CFB’s Holy Grail in 2004. Since USC blew out Oklahoma (a win that was later vacated as a result of Reggie’s bush league behavior), the ACC, B1G, Big 12 and SEC have all won at least one title. The Ducks have basically carried the conference in football for more than a decade, coming close twice, but no cigar. And in 2015, the Pac-12’s out of conference (OOC) record against the big boys was woeful. These preseason polls should not have any influence whatsoever on the College Football Playoff Committee, but based on last season’s voting, where less than impressive wins by Ohio State and a home loss by Alabama did not seem to matter when the Committee released its rankings. The projections by big media do seem to have influence. Oregon Ducks vs Ohio State at CFP Championship 2012. Clemson – 13-0 – CFB’s best returning QB. A strength of schedule (SOS) ranked last in the weak ACC with the Tigers playing only five teams that went bowling in 2015, two that went 7-6. At Auburn, in theory, could be tough, but the October 29 game at FSU is likely to be the only real hurdle to Clemson returning to the Final Four. This Playoff thing is not a fair fight! Ohio State – 13-0 – Has any team in the history of CFB ever had a worse one loss season? Lot of big time talent headed off to the League. But in his time at tOSU, Urban has lost only two B1G games, both to Sparty. JT Barrett is the best QB in the B1G. The Buckeye top-to-bottom talent is still the B1G’s best. The sense of entitlement is gone. I see Ohio State winning a huge OOC game at Oklahoma and confounding the experts by running the table. 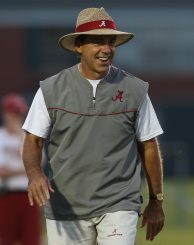 Saban looking very Southern in that hat. Alabama – 12-1 – The SEC is too deep for St. Nick Saban to run the table. But many of the guys who could have left early for the NFL decided to come back. Many a third-string guy on Bama’s depth chart could start for a majority of CFB teams. Average QB play is good enough. Saban wins titles on signing day in February. The NY Yankees of CFB make it a perfect Playoff three for three. Baylor – 12-0 – With his two starting pitchers sidelined, Art Briles’ Baylor offense in a close win against Texas and a blow out win over UNC in its bowl game looked like that of the Ducks; using the run to set up the pass. That was a great coaching job by Briles and his staff. Losing 11 excellent linemen does not help the cause, but Baylor has recruited extremely well in the talent-rich state of Texas. The OOC slate is again Charmin-soft, but I see the Bears winning in Morgantown and Norman and taking care of business with wins beside the Brazos against OK State and TCU. Notre Dame – 11-1 – If the Irish are not divided by the competition to see who will start at QB, I see Brian Kelly’s team as it did in 2015 when it was two plays away, making a serious Playoff run. The schedule is easier than last season’s, and getting Michigan State and Stanford in South Bend is a plus. Oregon – 11-2 – The good news? With coaches Brady Hoke and David Yost and Dakota Prukop already on campus, I see the Ducks claiming the Pac-12 title. The bad news? I see two losses, a split at Utah and USC and one other in the tough conference gauntlet grind (but please Not at Nebraska!) The bad news? Hard to say the Rose Bowl is bad news, but with two losses I do not believe Oregon will be in the Playoff Final Four. Coach Hoke before he became defensive coordinator at Oregon. Tennessee – 11-2 – Vols win the SEC East. But can Tennessee defeat the Tide in Knoxville and more importantly in the SEC title game? FSU – 11-1 – I see the Seminoles defeating Ole Miss in Orlando and then, with the exception of Clemson, cruising through the lightweight ACC. 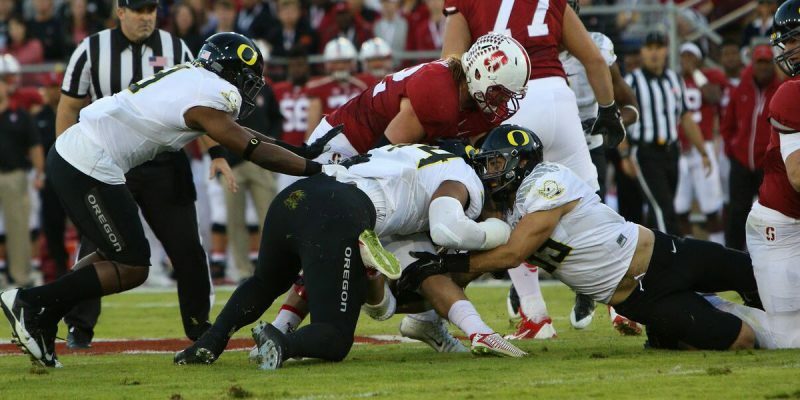 Stanford – 10-2 – With ‘White Magic’ Christian McCaffery back and David Shaw‘s excellent recruiting on The Farm, I see losses only at Notre Dame and in Eugene. 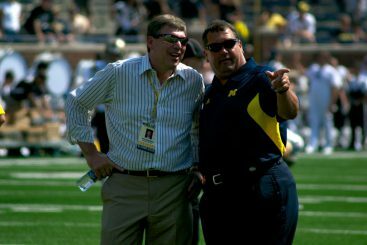 Michigan – 10-2 – The Wolverines somehow managed to find three teams that did not go bowling in 2015 and bring them all to the Big House to assure a 3-0 OOC start. Like the Ducks, looks as if another transfer QB will be the starter. Jim Harbaugh needs one more recruiting cycle to match the talent in Columbus. LSU– 10-2 - Les Miles was saved by a last-minute governor’s reprieve issued by the ghost of Huey Long. But Les needs to slay St. Nick if he plans to be in Baton Rogue much longer. He came oh-so-close in 2014. Will he prevail in Red Stick in 2016? 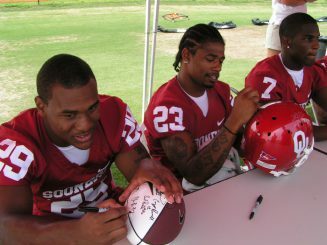 Oklahoma – 10-2 – Two ‘good losses’ to Ohio State and Baylor, but they are still losses. SOS – Good luck Clay Helton. USC has 2016’s toughest SOS, and it isn’t close. In 2015, the Trojans 2016 opponents went 101-58.